New York City Mayor Bill de Blasio and his security detail violated both U.S. and Mexican immigration laws by crossing the border on foot during a visit near El Paso, Texas, according to a letter from U.S. Customs and Border Protection (CBP). The mayor’s office flatly denied the allegation. 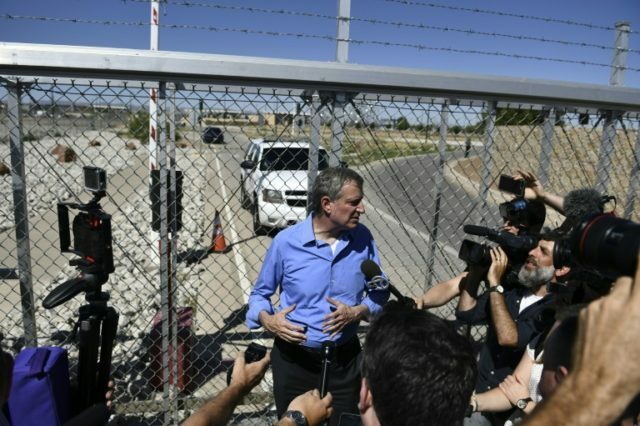 De Blasio, who has taken time away from his duties as mayor to protest the Trump administration’s immigration policies, went to the Texas border with nearly 20 other mayors from around the country on June 21, the day after President Donald Trump signed an order halting family separations at the border. According to the letter, a uniformed Border Patrol agent noticed a group on the Rio Grande River flood plain south of the Tornillo, TX, port of entry, taking photos of the holding facility. The agent asked if anyone from Border Patrol or public affairs was there to authorize their presence. A New York Police Department inspector said no, according to the letter, and when the agent asked the group how they arrived, they pointed to Mexico. Footage of de Blasio’s visit to the Tornillo Migrant Children’s Facility made the rounds on social media. “This is our federal government denying access, and not allowing information, and it’s not America. It’s crazy,” de Blasio told reporters while standing outside the facility’s gates. De Blasio spokesman Eric Phillips said the group did nothing illegal and had approval to be there. The letter was sent June 25 by Aaron Hull, the chief patrol agent for the Border Patrol’s El Paso Sector to New York Police Department Commissioner James O’Neill. The Mayor made headlines in June after calling for the abolishment of ICE. Following nationwide protests against the Trump administration’s “zero tolerance,” immigration policy, de Blasio told WNYC radio Brian Lehrer that the agency should be dismantled.
.@NYCMayor tells @BrianLehrer: “We should abolish ICE.” De Blasio also suggested Bernie Sanders would have won the White House had he been the Democratic nominee in 2016. De Blasio backed Clinton over Bernie. After the interview, de Blasio echoed his sentiments about ICE on Twitter. “Every country needs reasonable law enforcement on their borders. ICE is not reasonable law enforcement. ICE is broken, it’s divisive and it should be abolished,” de Blasio tweeted. Every country needs reasonable law enforcement on their borders. ICE is not reasonable law enforcement. ICE is broken, it’s divisive and it should be abolished.